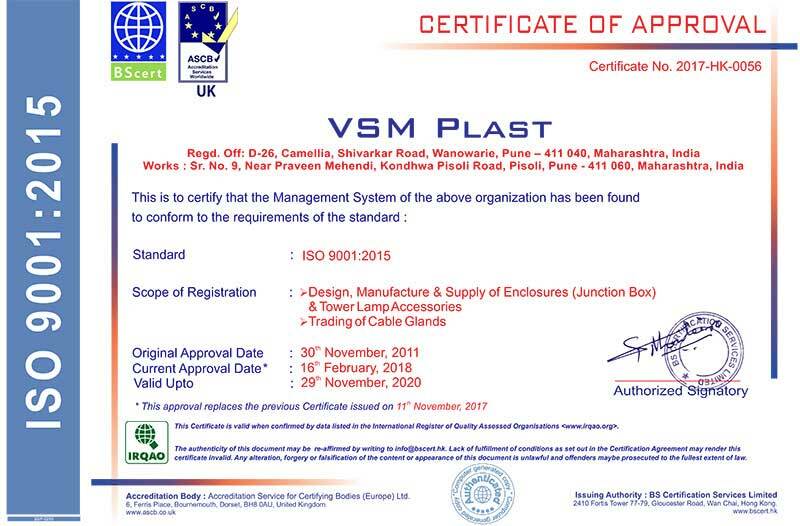 We at VSM Plast, is a engaged in manufacturing and supplying of quality and durable Waterproof Cable Glands, Electrical Cable Glands, PG Cable Glands, Metric Cable Glands, Junction Box, Aluminium Junction Box, Abs Junction Box, Polycarbonate Junction Box, Junction Boxes, Cable Junction Boxes, Electrical Junction Boxes, Plastic Junction Boxes, Plastic Enclosures, Industrial Enclosures, ABS Enclosures and Aluminium Enclosures. 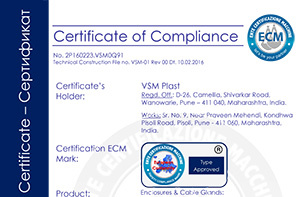 Owing to our stringent quality measures, we are confident that our range is at par with the international standards and are capable of meeting demands of our clients. These are manufactured from quality tested components and are widely used in various Electronic and Electric industries nationwide. We are constantly functioning towards maintaining our range of quality and at the same time competently meeting the emerging market requirement. With the help of our high-tech infrastructure, skilled workforce and quality assured policies, we have become a preferred choice by our clients. Under the able guidance of our mentor, Mr. Bhansali, we have carved a niche in this competitive industry. With his experience in industry, he has been instrumental in guiding our company towards success and growth in the manufacturing and supplying of waterproof cable glands, electrical cable glands, PG cable glands, metric cable glands, junction box, aluminium junction box, ABS junction box, polycarbonate junction box, junction boxes, cable junction boxes, electrical junction boxes, plastic junction boxes, plastic enclosures, industrial enclosures, ABS enclosures and aluminium enclosures. With vast industrial experience, we have been able to offer a diverse range of waterproof cable glands, electrical cable glands, PG cable glands, metric cable glands, junction box, aluminium junction box, ABS junction box, polycarbonate junction box, junction boxes, cable junction boxes, electrical junction boxes, plastic junction boxes, plastic enclosure, industrial enclosure, ABS enclosure and aluminium enclosures, to our clients as per their preferences. Further, other measurements are taken into consideration while manufacturing the product. We are assisted by a well-qualified team of professionals who have been instrumental in delivering quality, accuracy and consistent results. Each individual of our workforce is empowered with up-to-date knowledge and expertise that makes them fabricate our range of Waterproof Cable Glands, Electrical Cable Glands, PG Cable Glands, Metric Cable Glands, Junction Box, Aluminium Junction Box, ABS Junction Box, Polycarbonate Junction Box, Junction Boxes, Cable Junction Boxes, Electrical Junction Boxes, Plastic Junction Boxes, Plastic Enclosure, Industrial Enclosure, Abs Enclosure and Aluminium Enclosures, in compliance with the industrial standards and market requirement. Our professionals go through continuous training, resulting in constant research, innovation and development to provide our clients with excellent quality Plastic Enclosure, Industrial Enclosure, ABS Enclosure, Aluminium Enclosures and Cable Gland. Backed by their meticulous efforts we are able to expand our organization throughout the country and thereby retain the economies of scale. We have always worked hard to deliver supreme quality Plastic Enclosure, Industrial Enclosure, ABS enclosure, Aluminium Enclosures and Cable Gland to our clients and have never compromised on quality. Our management regularly reviews the utilization of quality objectives and make sure that the continuation is followed by the workforce. Right from procuring of raw material to finished product our quality remains the same. At our unit, we have all the testing equipment and instruments which are required for testing our products. It is only after our products undergo stringent checks and tests these are delivered to the client. Our management regularly reviews the utilization of quality objectives and ensures the continuation is followed by the workforce. Client satisfaction is our primary goal and since our inception we have maintained affable business relations with reputed companies in India. We have with us state of the art infrastructure that is equipped with hi-tech machineries to produce quality range of plastic enclosure, industrial enclosure, ABS enclosure, aluminium enclosures and cable gland. On understanding the specifications of our clients, we bring changes in the products. Well-defined parameters on the basis of which we customize the products are Size, Length, Width and Height. Further, our team of diligent quality inspectors is engaged in checking our enclosures from its start to its perfect packing so that we can offer flawless products. With a comprehensive range of items, premium quality and timely deliveries we have earn accolades from our customers.